Painting #28 of the 30 Day Challenge. Getting close to the end! 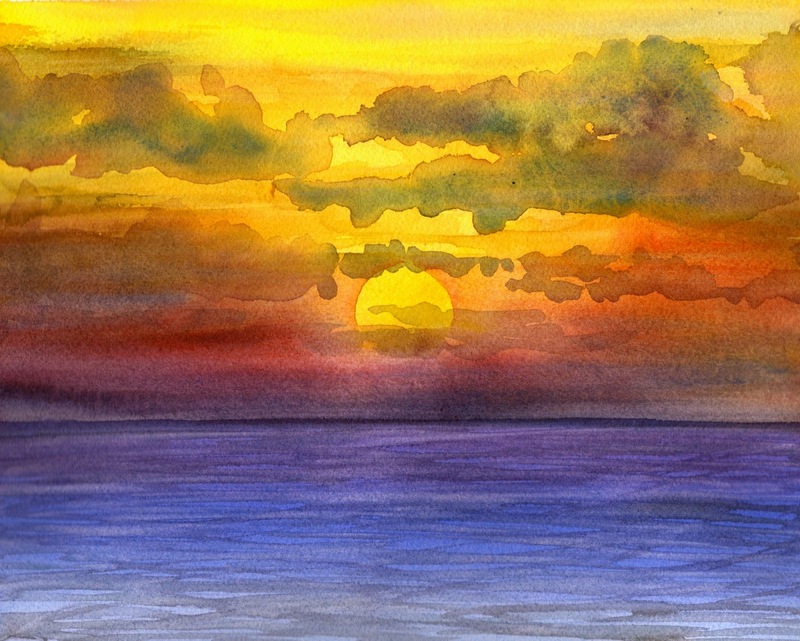 I’m glad I waited til the end to paint sunsets. I’ve always been a huge fan of the sky and sunsets are the sky at its best! I’ve been having a lot of fun going though old photos for this challenge. This was inspired by a photo I took while on a cruise with my husband for our 10 year anniversary. We had so much fun on the cruise. We left the kids behind and had a ball. 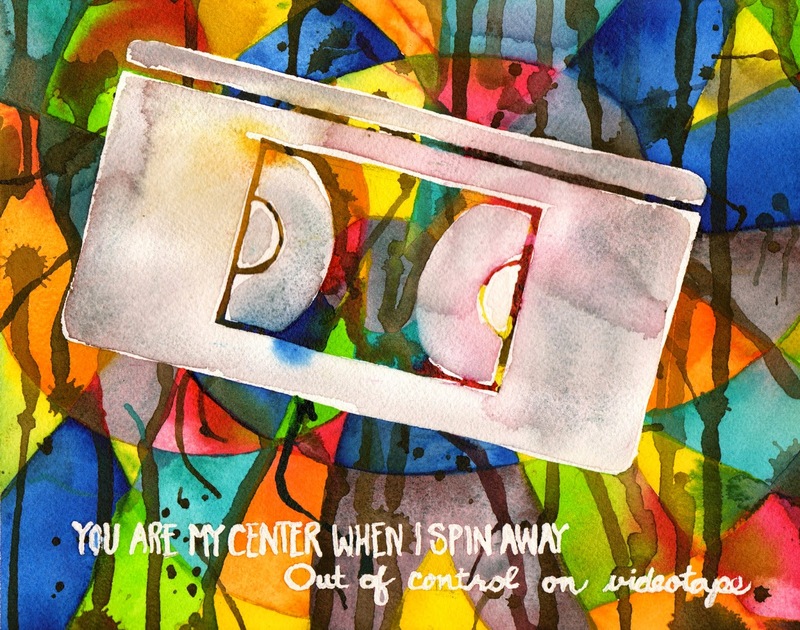 This makes Painting #26 of the 30 Day Challenge. All most there! 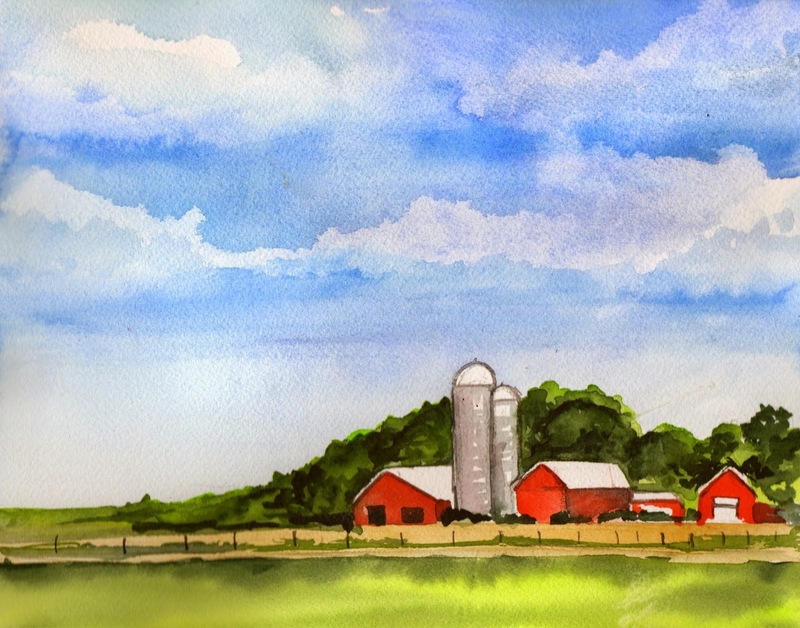 Painting #25 of the 30 Paintings in 30 Days Challenge is inspired by the many family vacations I’ve taken to visit my midwest family. Both of my parents grew up on farms in Minnesota. My dad’s family farm was passed down to my uncle so I had the pleasure of playing with my cousins at his childhood home. What an amazing experience! I love the farm. So many great memories. 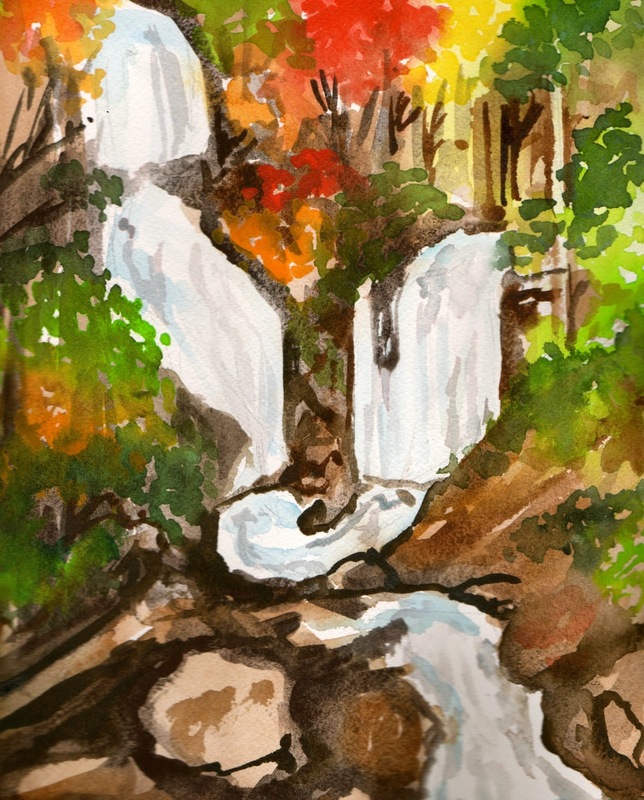 This quick watercolor sketch is of Anna Ruby Falls in Georgia. It makes Painting #22 of the 30 Paintings in 30 Days Challenge. I’ve been to Anna Ruby Falls many times in my lifetime. A few a couple times as a child, with my husband, and most recently with my best friend Kim when we drove to Georgia to pick up a vintage camper trailer that she plans to remodel. We had the best time. It was beautiful fall day – perfect weather and beautiful, colorful trees. 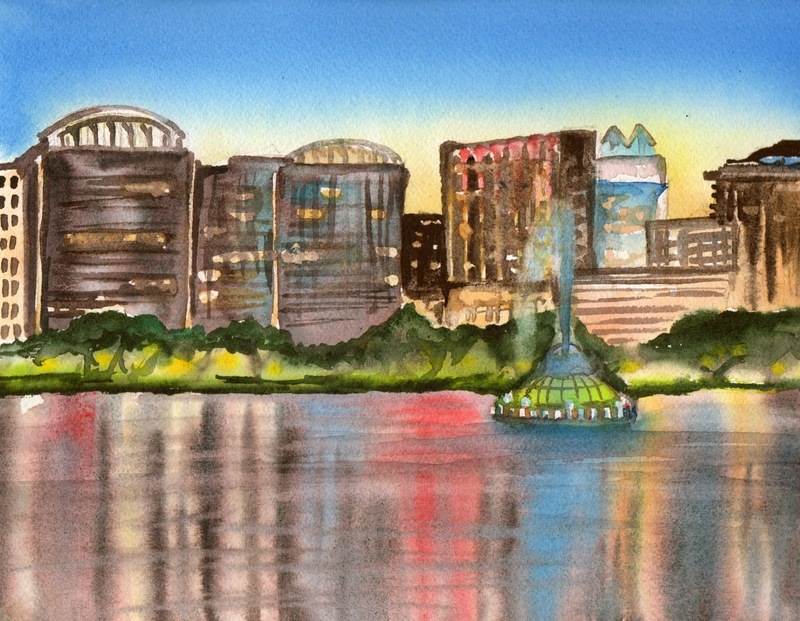 Painting #21 of the 30 Paintings in 30 Days Challenge is Lake Eola in Orlando, Florida. I live in Orlando. I really love the downtown area. It has a beautiful lake surrounded by tall buildings. Lake Eola has changed a lot in the 15 years I’ve lived here. For a couple years, the fountain was broken and it cost millions of dollars to fix it. They’ve added several sculptures and overall, the downtown area has thrived. Orlando is a beautiful city and I’m happy to live here. Nine more paintings left! I’m already planning the large-scale painting I’ll be painting after the challenge. Woo! I’ve been to Nassau, Bahamas a few times but never really fell in love with the island until I went there with my parent on their 40th anniversary cruise this past summer. 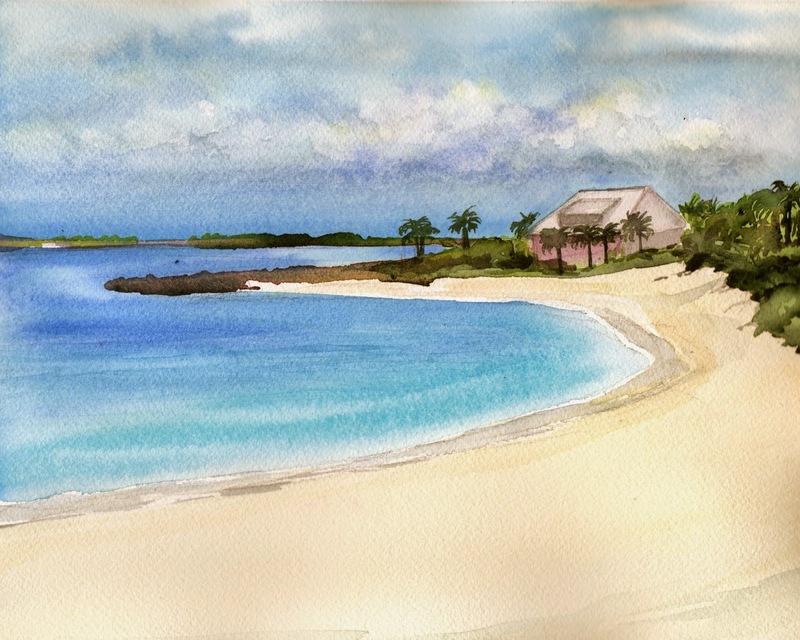 We went to a remote part of Paradise Island and found he most beautiful beaches. 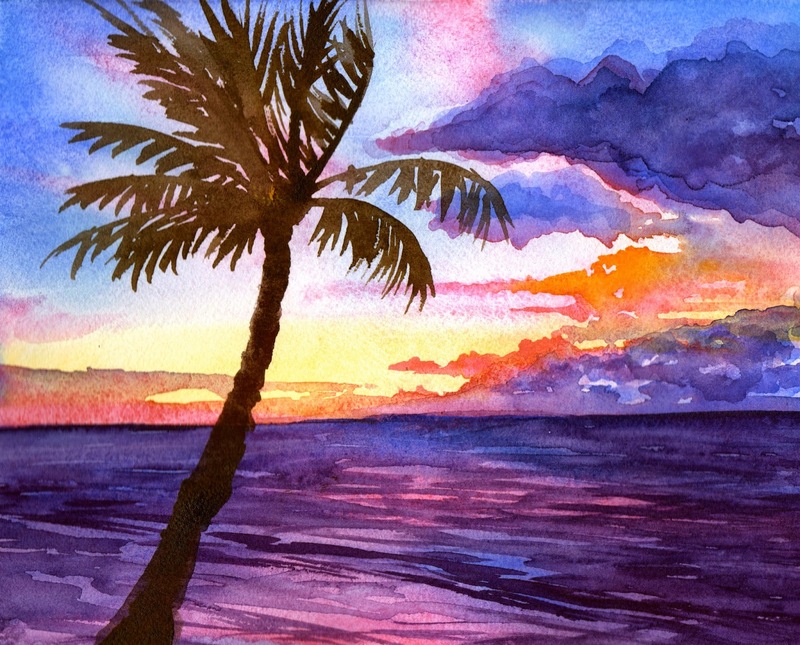 Those beaches inspired this piece. This is Painting #20 of the 30 Day Challenge. Two thirds of the way there! Hallelujah!! 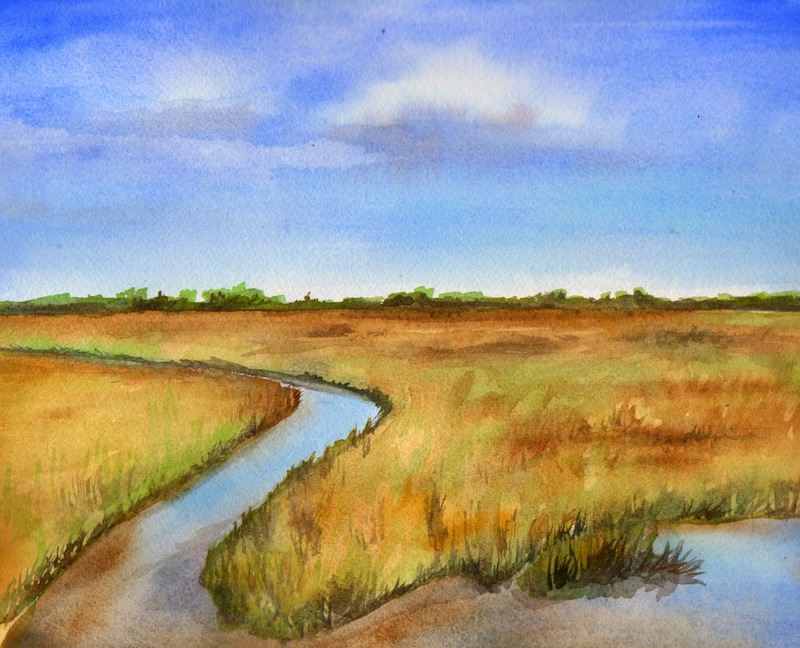 Painting #19 of the 30 Paintings in 30 Days Challenge, a Georgia Marsh. I love the marshes of southern Georgia. They are so peaceful and serene. I love the way the water winds through the grassy fields. Last year we spent a week in southern Georgia with family. We had a great time! 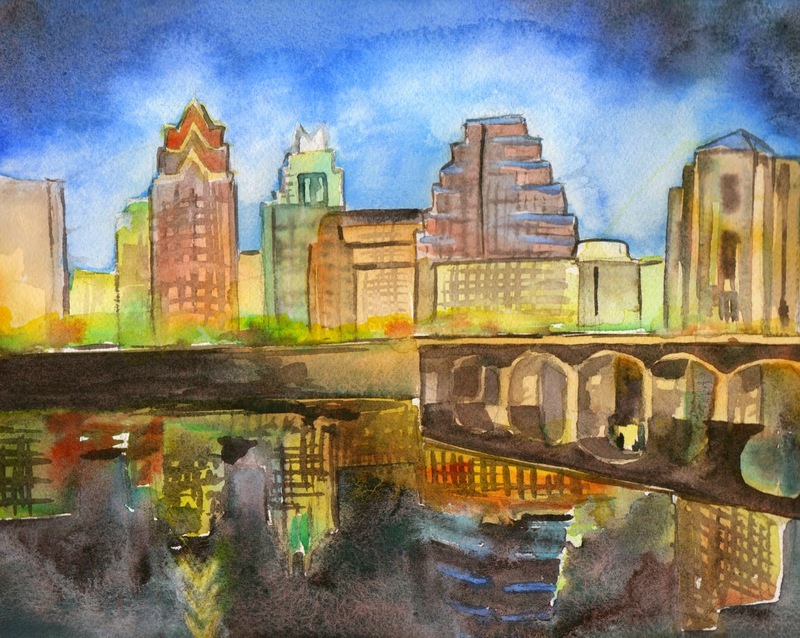 The past two years I’ve had the amazing privilege to attend SXSW in Austin, Texas. I love the city. The creative culture, live music, and city vibe is second to none. I’ve seen hundreds of bands play from all of the world, met amazing music industry people, and enjoyed awesome food. Austin has quickly become one of my favorite places. This is the first cityscape I’ve ever painted. I tried to capture the glow of the city. This is a quick sketch. I did the entire piece in about an hour and 15 minutes. This is painting #18 of the 30 Paintings in 30 Days Challenge.